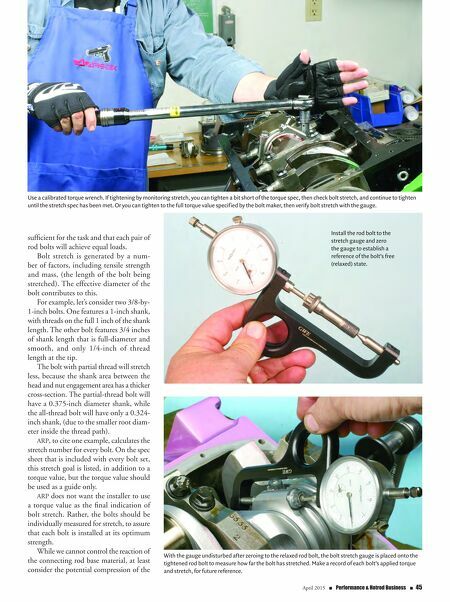 44 n Performance & Hotrod Business n April 2015 PERFORMANCE stretched short of its yield point in order for accurate, and most importantly, repeat- able clamping of the rod cap to the rod. Improper or unequal bolt clamping force can easily result in a non-round rod bore. Stock, or production, rod bolts typi- cally offer a tensile strength of approxi- mately 150,000-160,000 psi. However, due to variances in bolt production, tol- erances can be quite extreme, with peak bolt stretch occurring anywhere from, say, 0.003 to 0.006 inches. If the installer uses only torque in the attempt to achieve bolt stretch, he runs the risk of unequal rod bolt clamping loads, due to the potential inconsistencies between bolts. High-performance rod bolts are manu- factured to much tighter tensile strength tolerances. ARP, for instance, calculates each and every rod bolt for stretch, and the bolt packages include reference data to that effect. The instructions actually rec- ommend that a specific amount of bolt stretch be achieved on each bolt. (ARP cites 190,000 psi as its nominal, or base tensile rating, with actual ratings much higher in some applications). Bolt lubrication presents another vari- able. When a bolt is tightened with dry threads, as much as 80-percent of the torque can be exerted because of friction as opposed to bolt stretch. A set of connecting rod bolts' instruc- tions may list both a torque value and a stretch range, effectively giving you a choice of methods. Yes, tightening only to a specified torque value is quicker, and measuring bolt stretch requires more time, but the best results will be achieved by measuring bolt stretch. So, unless you're in a rush, take the time to measure stretch, tightening each rod bolt to the recommended stretch range. It's all about the quest for precision. Friction Factor If a bolt is tightened using straight torque, you may not necessarily achieve the desired pre-load due to the variable of friction. Since we can't predict the fric- tional loss, measuring rod bolt stretch pro- vides the most accurate method of ensur- ing that the clamping loads will be both If connecting rod bolts are to be loosened or tightened when the connecting rod is not attached to the crankshaft, the rod big end must be properly supported to avoid twisting the big end bore and beam. This connecting rod vise is bench-mounted and clamps the big end of the rod to allow bolt service without harming the rod. 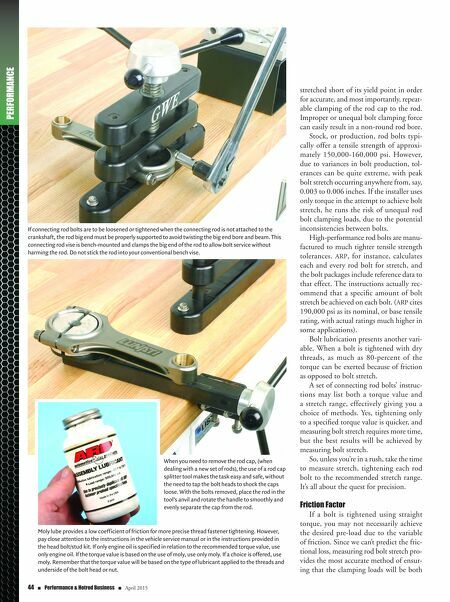 Do not stick the rod into your conventional bench vise. When you need to remove the rod cap, (when dealing with a new set of rods), the use of a rod cap splitter tool makes the task easy and safe, without the need to tap the bolt heads to shock the caps loose. With the bolts removed, place the rod in the tool's anvil and rotate the handle to smoothly and evenly separate the cap from the rod. Moly lube provides a low coefficient of friction for more precise thread fastener tightening. However, pay close attention to the instructions in the vehicle service manual or in the instructions provided in the head bolt/stud kit. If only engine oil is specified in relation to the recommended torque value, use only engine oil. If the torque value is based on the use of moly, use only moly. If a choice is offered, use moly. Remember that the torque value will be based on the type of lubricant applied to the threads and underside of the bolt head or nut.